Cleveland, OH (May 16, 2016) – Following the successful open house event hosted by Howard Hanna in April, the company is offering home buyers another unique open house experience. Beginning on Wednesday, May 18 in Pennsylvania, Virginia, Michigan and North Carolina and on Thursday, May 19 in Ohio, offices throughout our market areas will be hosting mid-week Twilight Open House events from 5:00 p.m. to 7:00 p.m. While it may be the digital age, open houses remain a top resource for those looking to purchase a home. 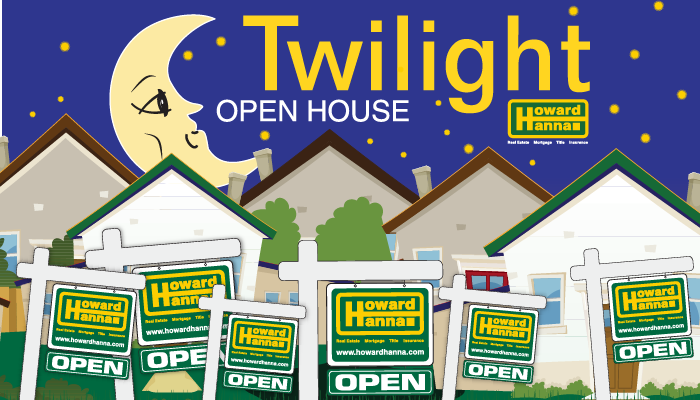 The convenient Twilight Open Houses are designed as an alternative to weekend tours. Howard Hanna offices focus on a different neighborhood each month, offering buyers the chance to view homes that are clustered together in a shorter amount of time. These monthly events bring together buyers and sellers in a new and convenient way. Each open house is being hosted by an experienced Howard Hanna sales associate, who will be available to discuss our exclusive programs, including “My First Home,” “Buy Before You Sell,” and our 100% Money-Back Guarantee. For a chance to view these great open houses in Pennsylvania, Virginia, Michigan and North Carolina, stop by an event on June 22, July 20, August 17, or September 14. In Ohio, the events are on June 23, July 21, August 18, and September 15.